UP Forest Guard Salary Hello Guys if you are checking out First time in this website about country wise Forest Guard Salary than you are in correct place. Indian Government has special rules and regulation of protecting Forest through various man power which works as Forest Department Employee. To keep them as a Part Time Temporary or Samvida, Probation basis Forest department mostly follows under its state rules and vacancies. Forest Department in Hindi States is MP, Rajasthan, Uttar Pradesh, Bihar etc. UP Forest Range Officer Salary after 7th Pay Commission: Recently Forest Department hike salary for its Forest Guard and Forest Range Officer. These two posts are kept in different pay scale, allowance, commission and holiday, leave grants. The Main duty of both Forest Guard is come under forest, vegetation, protecting wild life and arrest people who smuggle animals, species belongs to vilupt prajati. UP Forest Department Pay Scale Latest News: Update of 23.11.2018 Recently UP Van Vibhag has improves the Van Vibhag Samvida Karmi Salary, Mandey. 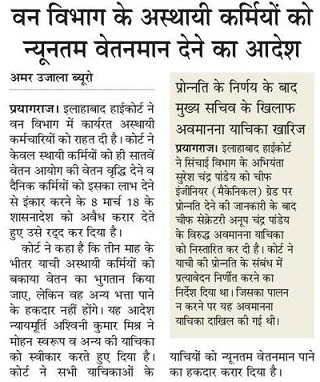 Now those UP Forest department employee who recruited as direct recruitment, Mritak Ashrit, Anukampa niyukti, through UPSSSC Forest Guard Salary, UPPSC Forest Range Officer, and Vidhan Bhavan Rakshak etc will be kept in minimum pay scale. The decision implemented on 23.11.2018 after many rally, protest organize by Forest Department Sangh, Association of Uttar Pradesh. Forest Range Officer of India, Salary: The Status of FRO in India is same as Revenue Inspection in Public Service Commission, Naib Tehsildar or Block Development Officer. Minimum Salary in Hand taken by UPPSC FRO Salary Rule is 42,000 Per Month. Time to Time they get DA TA, Holiday etc. Pay scales of posts sanctioned under the forest department( Forest Service). 3. Range Forest Officer: 9300-34800+4400. 4. Assistant Forest Statistician: 9300-34800+4400.